If you would like to follow me, you can do so by Bloglovin, Twitter, email or Linky . Question of the Week: Spring Break. Where would be your favorite destination spot if you could join the Spring Break festivities? 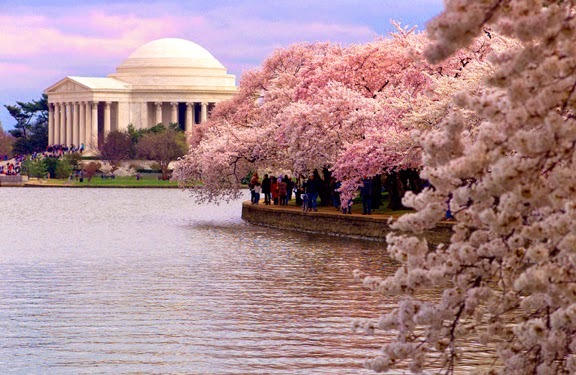 One of these years I want to make it to Washington DC for the Cherry Blossom Festival. I've been there before but never for that and it's absolutely on my bucket list. Ho-ly cow. I'd forgotten how gorgeous that is. I went to college there and loved it. I want to go to DC someday. My kids always want to do the beach every summer so I guess I'll have to wait it out! Thanks for stopping by my FF! I am a new Google+ and Bloglovin follower! Ohh wow! So beautiful. I've never visited DC, but, just... wow! New bloglovin and twitter follower, and added you on G+. Have a great weekend! I've never heard of that festival but it looks pretty. New follower via bloglovin'. I went to DC on a school trip in junior high but want to go again. I didn't fully appreciate it when I was that young. I'd love to go for the Cherry Blossom Festival, too! It looks beautiful! Hope you get to go very soon!